For better or for worse, I have never played World of Warcraft. Well, I guess a more accurate way to put it is that I never installed WoW on any computer I own. Sure, I have played it, but it was at a party...in college...and everyone was doing it...and I didn't inhale, etc. Although I am not a player, I still take interest in the World of Warcraft. For me, WoW's most fascinating aspect is its dynamic nature. With every patch, the World of Warcraft drifts further away from its initial incarnation. WoW is one of the most popular examples of games that never truly end and games that are never truly finished. As long as people keep playing and as long as Blizzard keeps patching it, the game is constantly in flux. WoW's forthcoming expansion, Cataclysm, epitomizes this philosophy. The Cataclysm will effect both new and old players alike by fundamentally altering the in-game world. 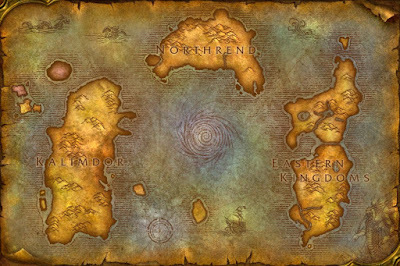 New players starting after the Cataclysm will be unable to experience the game as their predecessors did; unless they introduce time-traveling mounts, that Azeroth as we know it will soon be history. This is a bold, inventive move on the part of Blizzard, one that should spur us to examine the way we construct the history within and around the games we play. Although things like ROM hacks and mods have been around for years, most video games have a definitive version. For the most part, a game bought and played in 1989 will be identical to the same one bought and played in 1999. When a game's content is basically immutable, we are free to analyze it in relation to other games, as well as its relationship with the broader society into which it was released. WoW represents a challenge to this way of thinking: like most games, WoW's relationship with other titles and society at large is constantly evolving. With Cataclysm, it is clear that Blizzard seeks to construct a world that acquires actual history as time passes. New players do not join a game whose time-line is tailored specifically to them, and long-time players can only experience certain aspects of the game via their personal memories. One of the nice thing about studying institutions like the U.S. military or the Big Four Railroad barons is that large organizations often accumulate vast amounts of archival material. While not all of it may be purposefully saved or well organized, the fact that meticulous records exist makes them invaluable for reconstructing the past. I know nothing of Blizzard's archival practices, but I hope they would have the foresight to save old builds of the game for posterity. If Blizzard is not careful with old game material, we may be facing a situation similar to that of some of the earliest known films. Discarded, forgotten, or destroyed is a sad fate for our cultural artifacts. While Blizzard can archive WoW from the inside, players and analysts may preserve it from the outside. Projects like Archiving Virtual Worlds, professors like Stanford's Henry Lowood, and critics like Robert Ashley are all high profile examples of how we may go about preserving games. In WoW's case, articles like Jorge's post on cultural competition in WoW document changes in both game mechanics and player dynamics. The existence of a WoW wiki speaks to the dedication of some enthusiasts, but not every WoW player needs to be a WoW historian. Perhaps WoW would benefit from a Studs Terkel-like figure to collect the oral histories of players who lived through interesting in-game events? Ultimately, the goal is get a handle on a game whose composition is constantly in flux. In order to describe and analyze WoW completely, we must study the changes that happen around the game as well as the ones that happen to the game itself. Studying these expands our understanding about the intersection of game, medium, and society.